Wild Assembly: Provide an outstanding and interactive learning experience for your entire student body or large assembly group. 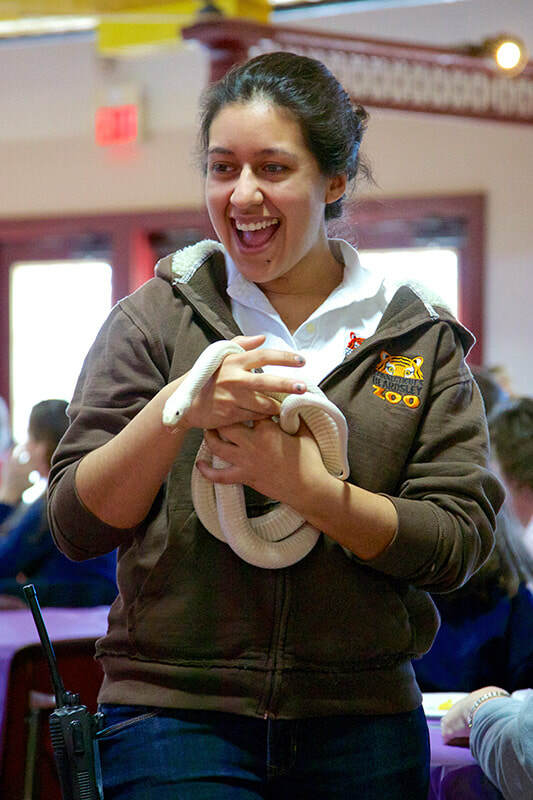 Our Wild Assemblies promote learning and improve retention of key concepts while introducing every member of your group to rare, beautiful and diverse species from across Connecticut and around the globe. Zoomobile: Welcome our live animal ambassadors to your classroom. Give your class the advantage of a learning experience only living creatures can provide as they meet and touch amazing animals and examine rare artifacts. Colleges & Universities: Invite a guest lecturer to spice up your syllabus. Our exotic expertise can supplement a variety of curricula. Our staff can create a topic specific lecture with thrilling images straight from the field, museum quality artifacts and even a few living, breathing creatures. Career Talk: Invite one of our Zoo educators to talk to your class about the many exciting and rewarding careers available at Zoos. Our educators will discuss the requirements, education, and experience needed to obtain an animal related career.